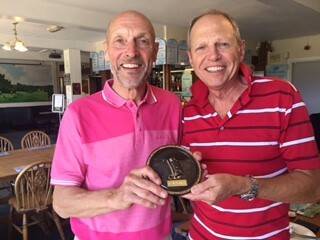 The LSSC Open was another top day for the Club’s golfers with Peter ‘Rat’ Rattue beating our guest of honour, former Saints defender Manny Andruszewski, by one point on the last hole to claim the trophy! 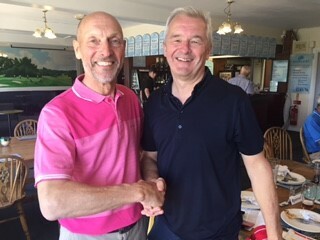 Luckily a sunny day greeted the golfers as they arrived at the Southampton City Golf Course for bacon rolls before the unheard of 8.30am tee time, arranged so everyone could make the last game of the season, against Stoke at St Mary’s. A field of 10 players, supplemented by former Saint Roger Fry, allowed only to watch after his previous exploits with a golf club, drove off in three groups. 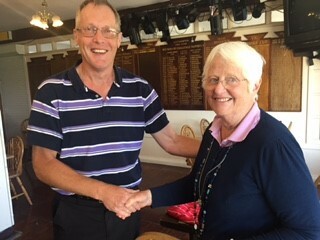 A competitive day ensued with five players tied on 28 Stapleford points for fourth place, with Peter Berkeley claiming third with 30 points – only awarded because, due to a lack of time the emergency meeting of the handicap committee to review Peter’s claimed 24 shot handicap, could not take place. Ray ‘Reggie’ Betts took nearest the pin, one of only two of the players to hit the Par 3 green on the 17th! And Rat collected the ‘longest drive’ prize with a monster strike that just about stayed on the fairway, despite Manny’s protests – he claimed that, as a gardener, he was the expert and adjudged the grass wasn’t short enough to be called fairway. The committee decided this was just green-eyed envy and gave the prize to Rat. 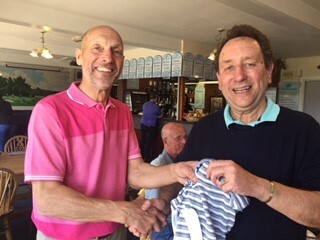 After a light lunch in the clubhouse Manny was asked to present the prize’s after John Quinn briefly recapped Manny’s exploits as a professional footballer, including the Eastleigh born Manny signing twice for the Saints, also playing for Aldershot and Andover and playing for three different clubs in the US. Manny also showed the generous side of his character by not only offering to buy the whole LSSC contingent a drink but donating a beautiful Saints commemorative golf accessory set signed by both Mat LeTiss and Kevin Keegan that had been in his possession for many years, saying ‘You guys are the true fans so one of you should have this.’ It was soon collected as first prize and now takes pride of place in Rat’s Salisbury home! A good time was had by whole, with the gloss only slightly tarnished by Saints loss to Stoke later in the day! Former Saint Manny Andruszewski presents winner Peter ‘Rat’ Rattue with the ‘Open’ trophy! 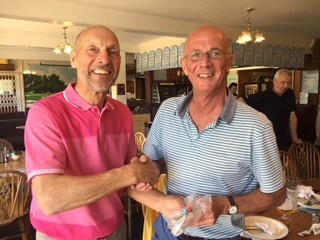 And Manny gets second place prize from former teammate Roger Fry. 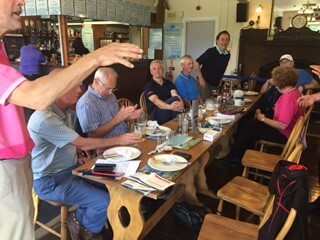 Lunch and prize giving did not last as long as usual – we managed to limit Manny to 10 minutes! – with kick-off not long off at St Mary’s. 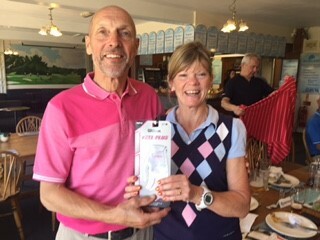 Co-organiser Tom ‘Trigger’ Henson’s Mum brought her Irish charm to the proceedings and presented Rat with his ‘longest drive’ prize. 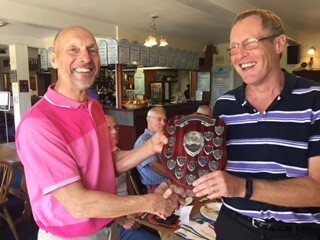 Peter Berkely, with a dodgy 30 Stapleford Points off his 24 handicap, claimed 3rd prize. 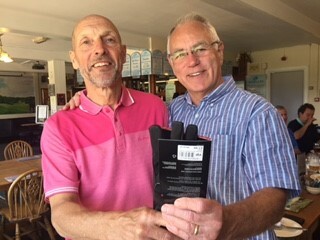 Co-organiser John Quinn presents Manny with the ‘top guest’ plaque and warms him to keep his hands off his wife! 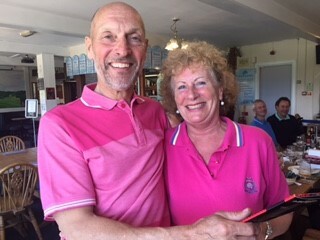 And wife Bella Paddock claimed the second women’s prize – two women played!